Say hello to the A10-7870K chip. Chipmaker AMD is targeting the gaming market with a new high-performance chip at a very attractive list price of $137. Compared to the A10-7850K, the A10-7870K sees a 5 percent increase in clock speed across the board. 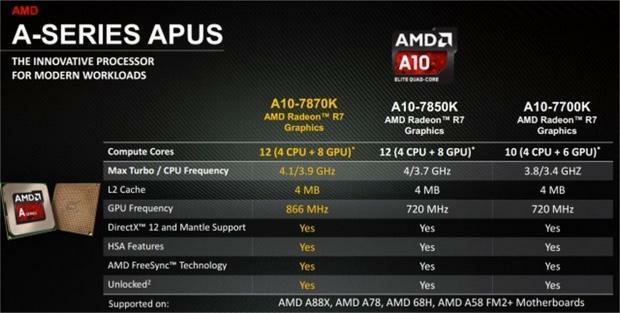 The CPU now runs at 3.9GHz with a turbo frequency of 4.1GHz, up from 3.7GHz and 4.0GHz respectively on the A10-7850K. 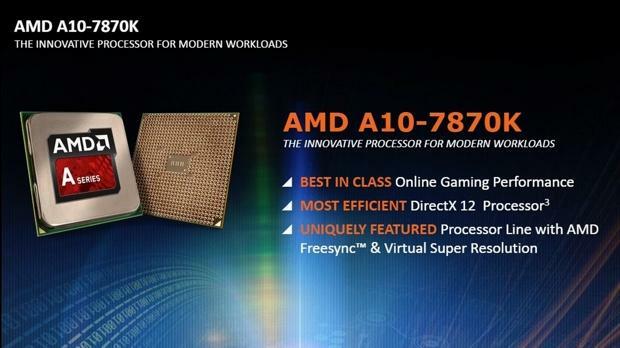 The A10-7870K a very compelling choice with a lower price than the A10-7850K. 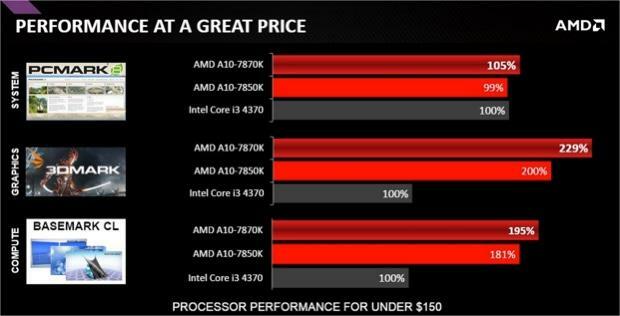 The chart below offers a quick comparison with the A10-7850K and the A10-7700K. 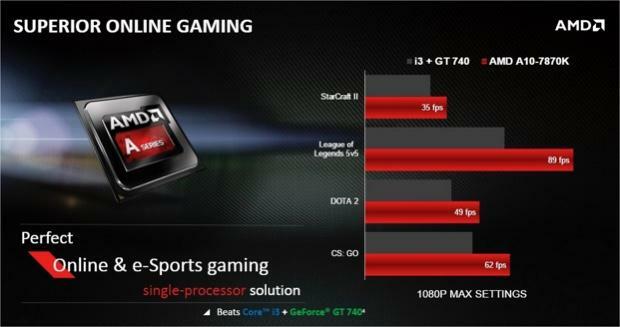 The GPU receives a 20 percent increase in clock speed, to 866MHz from 720MHz. The GPU also features 512 shader processors, 32 TMUs and 8 ROPs. Thermal Design Power for this part remains at 95 Watts. Cooling should not be an issue. This is good news as early AMD processors required significant cooling considerations. As shown below this chip offers a good choice for those interested in on-line gaming. The chip also supports FreeSync frame smoothing technology – also know as DisplayPort 1.2a – which can be found on a number of new monitors from the likes of Acer, BenQ, LG, Nixeus, Samsung, and ViewSonic. The chip supports Dual Channel DDR3 memory which should be used as the system memory for optimim performance. DDR3 SDRAM is an abbreviation for double data rate type three synchronous dynamic random-access memory, is a modern type of dynamic random-access memory (DRAM) with a high bandwidth (“double data rate”) interface, and has been in use since 2007. It is the higher-speed successor to DDR and DDR2 and predecessor to DDR4 synchronous dynamic random-access memory (SDRAM) chips. DDR3 SDRAM is neitherforward nor backward compatible with any earlier type of random-access memory (RAM) because of different signaling voltages, timings, and other factors. The primary benefit of DDR3 SDRAM over its immediate predecessor, DDR2 SDRAM, is its ability to transfer data at twice the rate (eight times the speed of its internal memory arrays), enabling higher bandwidth or peak data rates. With two transfers per cycle of a quadrupled clock signal, a 64-bit wide DDR3 module may achieve a transfer rate of up to 64 times the memory clock speed megahertz (MHz) in megabytes per second (MB/s). With data being transferred 64 bits at a time per memory module, DDR3 SDRAM gives a transfer rate of (memory clock rate) × 4 (for bus clock multiplier) × 2 (for data rate) × 64 (number of bits transferred) / 8 (number of bits/byte). Thus with a memory clock frequency of 100 MHz, DDR3 SDRAM gives a maximum transfer rate of 6400 MB/s. The DDR3 standard permits DRAM chip capacities of up to 8 gibibits, and up to 4 ranks of 64 bits each for a total maximum of 64GiB per DDR3 DIMM. Because of a hardware limitation, first addressed in Ivy Bridge-E in 2013, most Intel CPUs only support up to 4gibibit modules for 8GiB DIMMs. All AMD CPUs correctly support the full spec for 16GiB DDR3 DIMMs. You can sign up to be notified by AMD when the A10-7870 is available ! This chip is a good choice for your next gaming system, with a very attractive price tag.